To continue from my earlier post, Exploring Tikal in Guatemala, there is another magical section worth visiting that includes its own unique architecture and atmosphere. 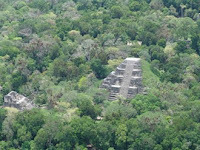 Known as Mundo Perdido, or the Lost World, it is an expansive complex of 38 structures that covers an area of approximately 646,000 square feet with a layout that is in harmony with the cycles of Venus, the Sun, the solstices and the equinoxes. It is also one of the oldest ensembles of Mayan structures solely dedicated to the observation of the stars. The top attraction within the complex is structure 5C-54, which is also known as the Great Pyramid of the Lost World (seen in above photo). This pyramid dates back to 500 B.C., and with a height of 105 feet, it was once one of the tallest pyramids in the Mayan region. 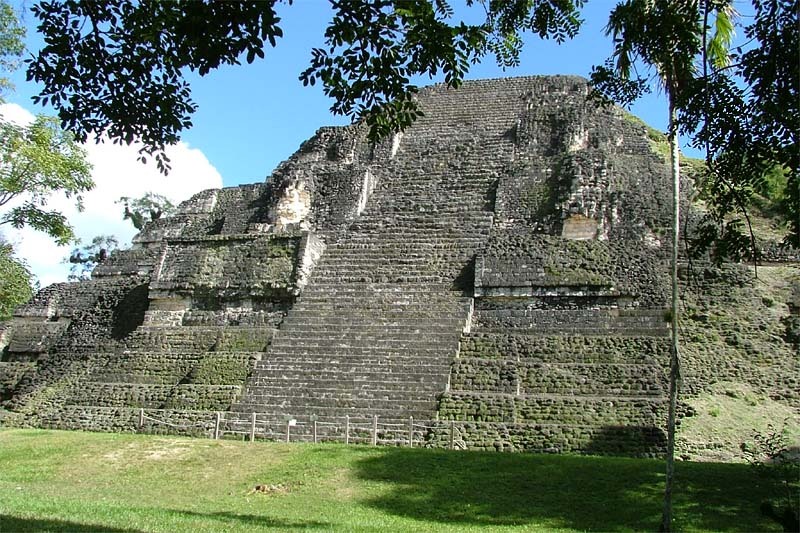 It still consists of incredibly steep stairways on all four sides with a flat summit that once held a structure decorated masks of the Sun God. You can just imagine groups of Mayans observing the stars and praying to the Sun God for thankfulness of their good fortune. But over time, the need for astronomical observations changed and the complex lost its overall importance. Not one to ignore former structures, the pyramid (like many other structures at Tikal) was remodeled and transformed at least three more times with the latest structures built in the 4th century. The former royal palaces within the complex were also replaced by structures that were more administrative in function. Unfortunately the pyramid is currently off limits to the public due to the instability of the steep stone staircase, which has recently caused several deaths. It is too bad, because it was known by many visitors as one of the best locations to view the sunset in Tikal. Located just toward the east is a long terrace that includes three temples that were formerly used to observe the stars and mark the time for visual observations throughout the year. Inside the three temples were six tombs for the royal members of Jaguar Paw, who ruled in the 4th century but lost their power after an internal (and violent) dispute in A.D. 378. Another remarkable attraction is the structure 5C-49 built in A.D. 250. It was constructed in talud-tablero style, which is an architectural style often used in pre-Columbian pyramid construction. It consists of a platform structure (the tablero) on top of an inward-sloping surface (the talud). Since this site was considered sacred to the Mayan people, it was fortunately preserved in its original form and remained unchanged even though the majority of other structures were being repurposed. Since the main pyramid is closed to climbing, some guides tend to condense their tour of this area and focus on the more interesting temples near the main plaza. 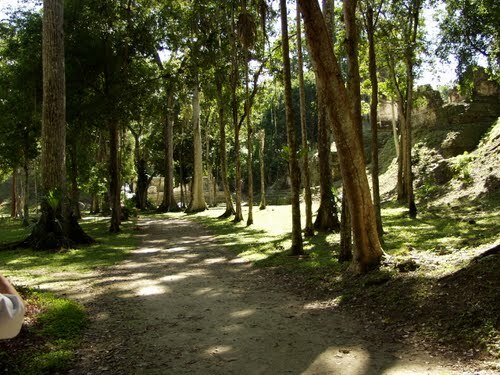 But make sure to set some time aside to explore the area on your own because it offers another side of Mayan culture that was formerly devoted to the study of the stars. This fact alone adds to the magical quality of this spectacular Mayan site and it comes as no surprise why Tikal was even included in scenes from the Star Wars films. For more information about Tikal, read my post: Exploring Tikal in Guatemala. I went to Guatemala last summer and regretably I could only spend a few days there. I recommend to anyone travelling to go to the North of Guatemala to see some of the Mayan ruins. I didn't get to visit Tikal, which is one of the best preserved sites in the whole region. Just a final note. If you are going, the Lonely Planet guide (Guatemala, Belize and the Yucatan) is excellent. Thanks for reading! Yes, the next time you come to Guatemala, try to visit Tikal. It is amazing! It's always interesting to read through articles from other authors and use a little something from their websites.